Are you planning significant home renovation work in 2016? Would you like to make sure the project doesn’t affect your routine too much? Then you’ll need to prepare for the workmen and ensure you leave no stone unturned. We’re going to offer some suggestions today that should help you to navigate the process. At the end of the day, the level of disruption will depend on the nature of the work being carried out. However, there are some things everyone can do to guarantee their families don’t end up in a mess. Use the advice in this article to your advantage, and don’t overlook anything important. The workmen you employ are guaranteed to make a big mess on your property. Even so, you’ll make their lives much easier if you clean the entire home ahead of time. You’re hiring professionals to complete a complicated job, so don’t make the mistake of paying them to tidy your mess. Plumbers and builders will need a lot of space to work, and so they will have no choice but to clean if you haven't prepared the area. Take all your valuable items and place them in boxes somewhere safe. That way, you won’t have to worry about breakages during the renovation project. As we just mentioned, workers who come to your home will create a lot of mess. They also might need to remove old furniture and suits depending on your goals. So, it’s wise to look for a residential skip hire company long before they arrive. In most circumstances, you just need to search online to find a specialist in your local area. Rental costs aren’t as high as you might expect, and most firms offer an excellent service. They will drop the item at a location of your choosing and collect it when you’re finished. The skip company will dispose of all the waste, and so you don’t need to visit the landfill site. It’s always sensible to speak to your team of workers ahead of time and view their schedule. That should help you to work out if you need to stay somewhere else on certain days. Maybe they’ll need to turn your water off half-way through the job? Perhaps they want to start early one morning to ensure they finish certain tasks in a single day? Knowing their plans will help you to determine if hotel rooms are required. Those of you lucky enough to have close friends and relatives might ask if you can stay with them. When all’s said and done, your goal is to make sure the kids can get to school, and you don’t miss any deadlines at work. So long as you put that advice into practice, the renovation work shouldn’t upset your family. As soon as the job is complete, you can get back to normal and enjoy your new home. If you have any more concerns, just speak to your team of professionals and come to a solution. You’re paying their wages, and so you have control over their working times and strategies. This day has been such a long time coming. 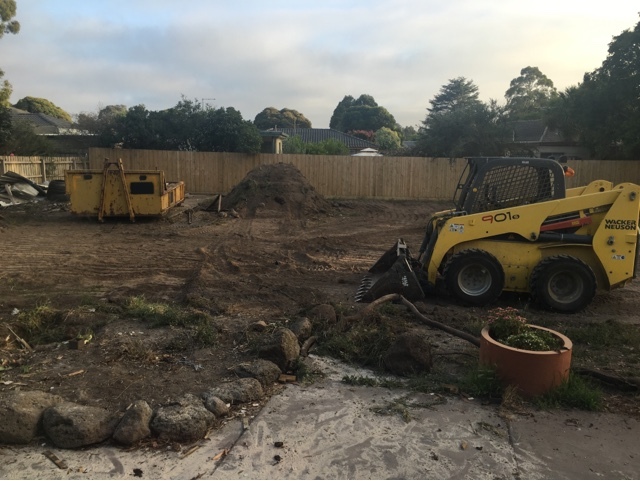 If you've been reading my blog for a little while you will remember that we bought our house to subdivide and build a house in our backyard. The plan was to be in this house for 12 months and then move into the house in the backyard. 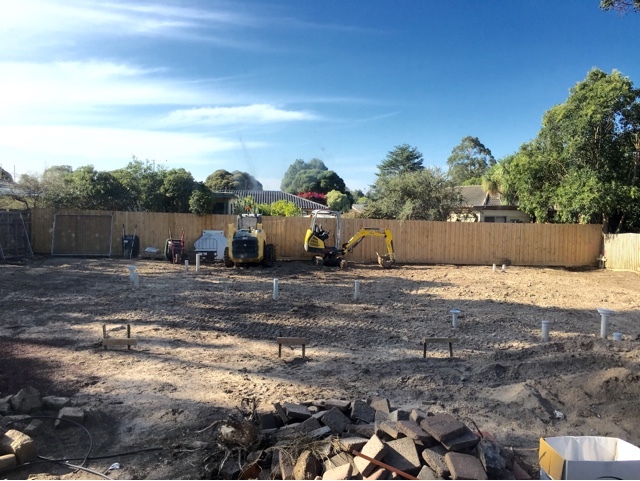 Well so far it's been just over 18 months and we have only just started digging up the backyard.....FINALLY!!! Don't get me wrong I understand the whole process takes time but wow the set backs have been super frustrating. 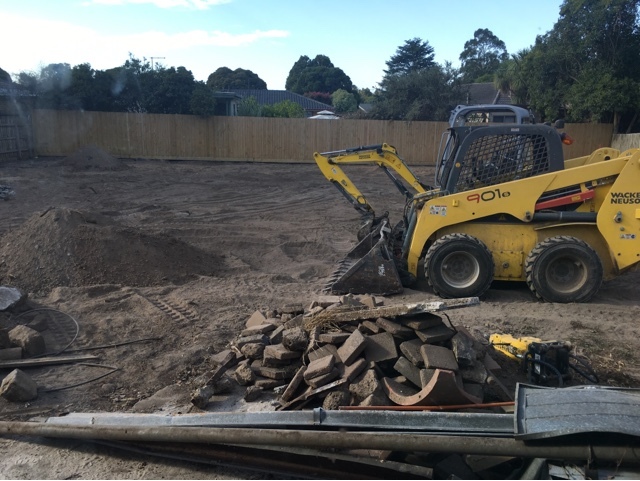 So today I'm so freaking excited about the massive trucks around our house making a heap of noise digging up our backyard. For the next 6 or so months we won't have a backyard, no where for our daughter to run around, no where to park our cars, dirt everywhere, noise and trucks showing up super early every day.......and I couldn't be more excited!!! I can't wait to share the whole process with you all and of course get to styling our new house. I have already got a box full or stuff to decorate that I have been holding onto for months! Our plans are always changing so I'm not going to make the same mistakes with this house as I have every other one. We have already lived in 2 temporary houses, this temporary house will be number 3 until we find and move into our family home. The home that we will live in for 20+ years, the home we will raise our children in. I have so many fun ideas that I can't wait to get stuck into. I guess I'm lucky though, trends change, and because we are moving so often I get to keep up with the trends and change styles all the time! So many exciting things headed our way and I hope you can all be part of it. Most of us are passionate about interior design and styling our homes. And we know just how much it’s worth to the value of our homes too. But sometimes it’s easy to forget that the outside of our homes need to be just as attractive. Gardens are especially popular right now as people want to use their outside areas for more and more purposes. The first thing to consider is your home’s kerb appeal. What does your house look like to passers-by on the street? Take a picture from the other side of the road, and see what you think. Could the windows be better dressed? Perhaps the rendering is starting to a look a little tatty. If you have gardens and shrubs at the front, it’s important to keep them neat and tidy. You could also repaint your front door. Hot reds are a very popular colour right now. Vibrant purples can look very stylish too. Maybe you could change the door knocker to something more contemporary? Even the porch lighting fixture could make a difference to the overall appeal of the front of your home. The back garden is one of the most popular places to entertain guests. Barbecues and al fresco dining make this area very difficult to maintain to a high standard. If you are about to redesign your garden, consider the best places for outdoor dining. You want to be within close proximity to a door back to the house, but you also want to be at the best vantage point to admire the planting. You may also have a pool area in your backyard. This should be securely gated to avoid children and pets coming to harm. Are you looking for a bespoke design to create a good flow from one area to another? You could use a company like Tim Davies Landscaping to offer a detailed plan. It can take a lot of work to redesign an entire garden, so consider calling in a professional team. Are you styling your garden with a view to increasing the value of your home? Consider creating different areas for everyone in the household. You might need a pet area that is separate from the kiddy play area. Soft artificial grass or play bark could be installed to provide a safer surface for the children. You may want an outside dining room, complete with grill and dining suite. Low maintenance planting is very popular. Low shrubs and small areas of lawn offer plenty of greenery. Paths and seating areas could be decked to help retain a natural look to your garden. You may also want to have some flowers in pots that can be moved around to add a splash of colour to the different areas. And if you want to grow your own food, this can be done in pots too. Adding outdoor lighting to your exterior areas helps your home look attractive whatever the hour. Colourful Tiki lights can be particularly appealing. Try to make your garden one of the best rooms for you to enjoy at your home. I hope you all had a fantastic new year, we didn't really do much, already sleep deprived with a little one and a toddler we decided to have a quiet one. So waking up on January 1st feeling fresh and ready to go I started thinking about what adventures this year would bring. First things first, learn to feel great about myself. 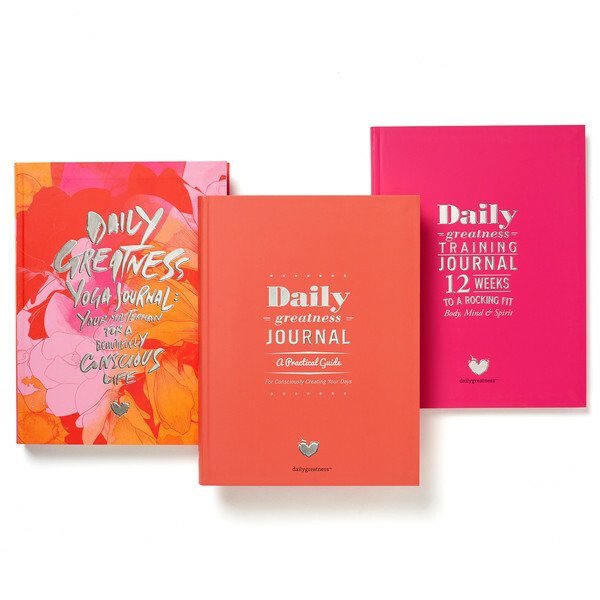 To help me with that I've got my Daily Greatness Journal. 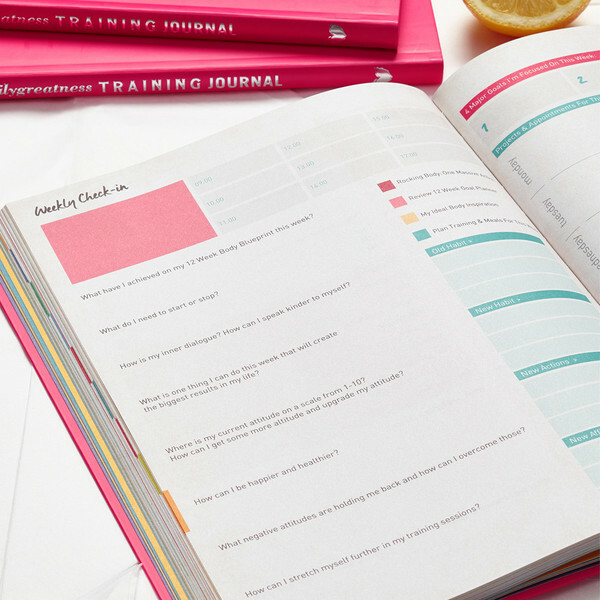 These journals are help prepare for each day and assist with that extra motivation. Fitness is a big part of my greatness goals for this year, very luckily I snagged myself one of these for Christmas. 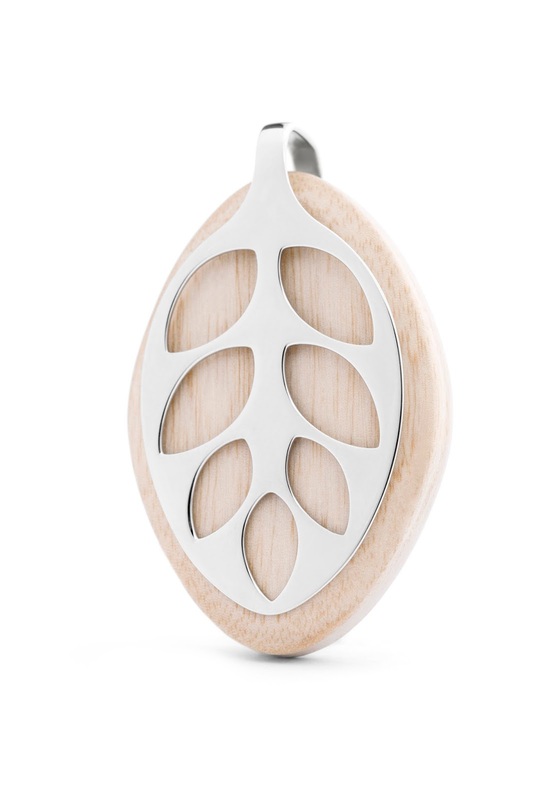 It's called a Leaf Health and Fitness Tracker by Bellabeat. Head over to their website here to check them out. In my opinion it is the first pretty fitness tracker on the market and I'm already in love!! I also have plans to head back to the gym, after months on bed rest and then not being able to exercise due to c-section delivery I feel like I'm ready to get back into it. I love the Les Mills Body Balance class and the Les Mills Body Attack class. It might take me a bit longer to get back into Body Attack but I can't wait! I definitely feel like I'm on my way to feeling great about myself, bring on 2016! !